Even though the stock market has recovered a bit of late, middle class investors have shown a reluctance to re-enter Wall Street’s less-than-loving embrace. Gone are those high-flying days when stocks, bonds, and mutual funds were considered the keys to a financially solvent retirement, replaced with, what exactly? 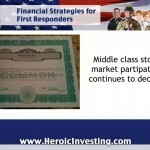 Nothing yet, it seems, but we at Heroic Investing think you’d be smart to consider a move to income properties. Here’s why. Middle class average income has run into a brick wall. Education and health costs relative to income has reached the stratosphere, and to a larger extent than we can recall in recent memory, the middle class has decided to ditch the idea of upward mobility, saving, and in a growing number of cases, working at all. One area where we’re really noticing a behavior change is in equity ownership (that’s stocks in case you were wondering). As recently as 2002, 67% of American households owned a piece of at least one publicly traded company. By 2011 that number had declined to 54%, with the largest decline seen in the middle class. While columnists hither and yon continue to devote millions of pixels to a thorough chewing of the issue, at Heroic Investing we are less concerned with why this massive chunk of society has decided to disengage from many of the traditional economic processes and eschew the stock market, than with stepping in with an alternative. Make no mistake, the stock market is a bad deal for the average investor. Administrative and transaction feed, as well as a chronic case of inflation combine to drag whatever profit might have been realized down to anemic levels. The truth is we haven’t invested in the stock market in a very long time. Our founder, Jason Hartman, realized during his college years the near miraculous profit potential of income property investing when compared to the rigged game of equities. If the ideas of creating wealth and reaching the land of financial independence hold any interest to you, the only real choice left is real estate. Gold is shiny and a better investment than a fistful of stock certificates, but nothing holds a candle to history’s best investment – the land beneath your feet. While no one can rebut the fact that the American middle class is fleeing Wall Street and traditional economic participation in droves, who can blame them? Under the embarrassing leadership of recent politicians and bureaucrats, our country is a basket of rotting fruit.